Someday I'll Sleep Autism Blogs: Why Is It So Hard To Find A Simple, Reverent Mass?!?!? Why Is It So Hard To Find A Simple, Reverent Mass?!?!? Mass has been getting more and more "interesting" lately. First there was the sudden increase in volume in the music. I turned to glance back at Paul and Mae in the back last week and noticed that people were literally plugging their ears because the microphones for the organ and piano (and cantors) are turned up so loud that it's kind of painful. As we were walking out we heard a man say: "If you weren't deaf when you got there, you are now!" or something along those lines. Then a second microphone was added, next to the cantor's microphone and a new woman appeared so there are now (it seems) two cantor's. I was trying to focus my attention on the Mass, and was somewhat successful (Sadie was actually being pretty good) when a loud jazz tune came from the organ (that's the closest music I could think of to describe it to... although now that I think of it I think it was supposed to be a sort of southern-gospel-revival-type of song) and the responsorial psalm was transformed into a sort of jazzy show tune. The part we were supposed to say was something like: "Taste and see the goodness of the Lord" or something like that repeated five times. I thought, that's an odd psalm (mostly because of how it was being... presented...) and glanced at the missal. It said: "Praise the Lord, Jerusalem." I'm sure the other was the alternate since it Corpus Christi Sunday, and that's all well and good... I guess what bothers me is the blow-your-eardrums-out-of-your-head volume. Now I should admit that I had my first bout of real morning sickness yesterday, so I was sitting in the pew, wondering why it was 80 degrees inside, trying not to get sick during all of this. My mood was not... the best... (I was really trying... but ugh... morning sickness and that faint, I can't feel my lips feeling aren't a great combo). Then I heard these words during the homily: "And the proper way to receive during Mass is with your hands extended like this. In your hands." Maybe he saw the look on my face (we do sit in the front row). Maybe he would have added it anyways because there was a quick: "Or if you want to you can receive on the tongue." And I thought when did "By indult only" become "the proper way"?!?! Oh, it's allowed. It's certainly allowed. But implying that it's superior? The pregnancy hormones were raging. Then the liturgy of the Eucharist started and I tried my level best not to think of high-school musical. I've said it before and I'm sure I'll say it again: our pastor has a fabulous voice and loves to sing. He would be great on Broadway. And I would love to see a Mass that was chanted (gregorian chant or something like that). But I spend Mass thinking, I've been dropped into High School Musical. He's going to start dancing on the altar (I should note: that has not happened...). Have you ever seen a Mass done in this style (if you haven't seen High School Musical think of a good Show Tune and imagine Mass done in that way... all of Mass...)? It's odd because it just seems to be... about the person or people singing... and I'm sure everyone appreciates the Eucharist (part of the homily was a beautiful tribute to the Eucharist and how it is the body and blood of Christ)... but for much of the liturgy the focus seems to be somewhere else, on the super loud music and the very loud singing. So I am looking forward to living in an area with a Tridentine Mass (the closest one to our current location is well over two hours away... we already drive over an hour, each way, through the mountains to get to Mass...)... or just a nice, simple NO Mass (I'm hoping we can attend a Latin Mass on Sunday and at least one NO Mass during the week... at least that's the dream!). One more month of show-tunes. Hopefully all of our eardrums are still intact when we make the move. You have my sympathies. We have been parish-hunting as well. Our nearest Tridentine Mass is about 45 minutes away in the city. I'd like to get there one day. For the time being we are hunting closer to home and taking into serious consideration the parishes' sacramental prep policies since Cecilia is beginning Kindergarten this year. I remember once my mom was lectured at her parish, after one of my visits, that a person who receives on the tongue, as they seemed to see me do as my mom doesn't, means that person "rejects Vatican II." I had to explain to my mom the truth of the matter, but it doesn't seem to be an uncommon misunderstanding. I believe, if you can find a few like-minded people, you can petition your diocese to offer a Tridentine Mass in your area. My husband has been half-joking he may do that. I'd love to go to one, but I have a hard time petitioning for one when I've never even been to one before. Hope your ears and resolve can hold out a few more weeks. I'm so sorry! In contrast, our homily yesterday included the instruction that receiving on the tongue is the proper way, and that only in rare exceptions should we receive in our hands. And how the Holy Father will only dispense the Eucharist to people who are kneeling and on their tongue. Our almost 3-year old sat through the whole 2-hour high Mass. There was a beautiful procession afterward for Corpus Christi. You would have been in Heaven - quite literally! I'm so glad I'm not the only one who feels this. We go to an Anglican Use mass as often as possible because we don't have to deal with that kind of stuff. I am so sorry! That sounds pretty awful. I love with parts of Mass are chanted or sung, but there is a line and that sounds like its crossed it. Btw... Not to nitpick but you have a typo that made me literally LOL (and got questioned by my daughter) when I probably shouldn't have. You put blood of Christy instead of Christ. Hope the morning sickness goes away soon! I'm with you on the morning sickness.... And a Mass like that wouldn't help. I'm sorry you have to deal with all of that. Prayers for you and especially your ears as you endure one more month. God bless. It is a sadness that so many priests seem to feel the need to jazz up the Mass, to make it more "user friendly", instead of just believing that it can stand on its own, and be beautiful on its own. Happily, you will soon be in an environment that's more conducive to prayer. But - take heart - NOTHING could top the abomination that happened at my parish's Mass yesterday (I wasn't at that particular Mass, I had an e-mail about it from the priest who said that Mass - he was flabbergasted, and he's been in the priesthood for 30 years.) What we are asked to put up with! I went to Catholic Mass until I was eleven and so took Communion for a few years. In my CA church, we children were taught to accept in the hands and receiving on the tongue was never mentioned. I was always curious and thought it odd to see otherwise. It's interesting to read your posts from the opposite perspective. 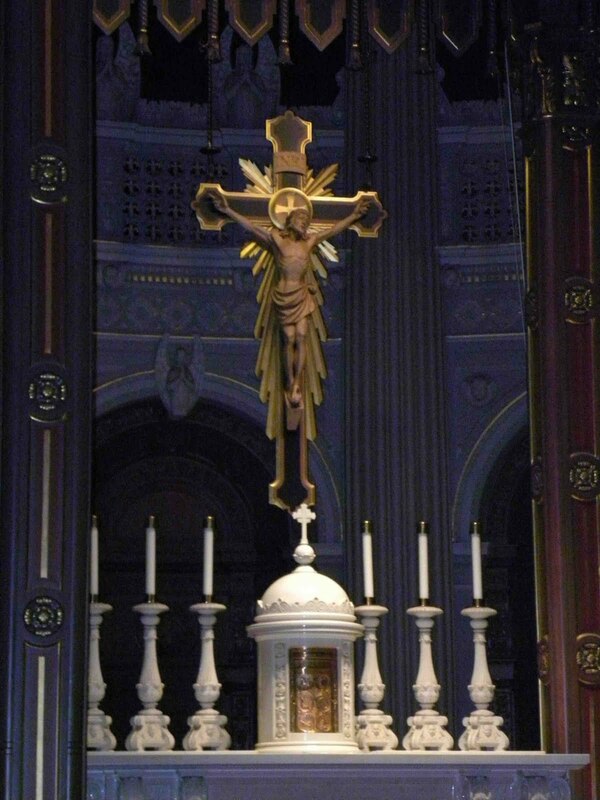 I wish I could move the EWTN Mass from Birmingham to San Antonio, TX :^) It is so beautiful. I think I attend the TLM parish you mentioned was 2 hours away so maybe before you move, you will be able to head down this way...Let me know when you do. And I am so glad the Holy Father is making drastic changes in the Mass so we don't have to worry about irreverent celebrations of the Mass. Hopefully. I knew it had to be an even number!!! Father spoke about the Holy Father's distribution of the Eucharist as well. He said that while Pope Benedict XVI will distribute the Eucharist in the hands while out in public, in this private setting, he can require people to receive on their tongues while on their knees. He said it was his way of speaking to the reverence with which one should receive our Lord. One thing that piqued my interest though was that Father said that the original way to receive the Eucharist was in the hands, before receiving on the tongue. Does anyone here know anything about that? I was thinking of asking him about it this week. Though now that I think about it, if they were modeling Jesus at the Last Supper, they would have eaten in the same way. I'm not trying to be an antagonist, I had just never thought of it that way. As to various Masses, when we moved to where we are now, we were 'church-hopping' for a few months because we couldn't find a Mass where we felt comfortable. At the church closest to us, our first homily began with, "I'm in mourning... My beloved Yankees are out of the playoffs." (Now I love sports, but...). At another parish, where my friend was the pastor, they all stood during the Consecration and called the church a Worship Center instead of a church. We went to several churches and finally found the parish where we are now. Of course, it's the one that's the farthest away. It's a larger, more conservative parish, though there are still some things I wish were a bit more so. We have a priest at our nearest Catholic church that does his singing musical style. It drives us crazy because he also has the organist play along which is against the GIRM. When the choir was responding to the priest, back and forth style, completely out of context my husband decided it was time to go to a different Catholic church. When I spoke to my old choir director at the cathedral his comment was that the priest thinks he's God's gift to music. Not all that charitable but I can see what he means. What I really liked about going to Mass in Florida was that the state troopers direct traffic when Mass is over so that all the cars are able to leave and get on the road without accidents. :) I wish they would do that here.